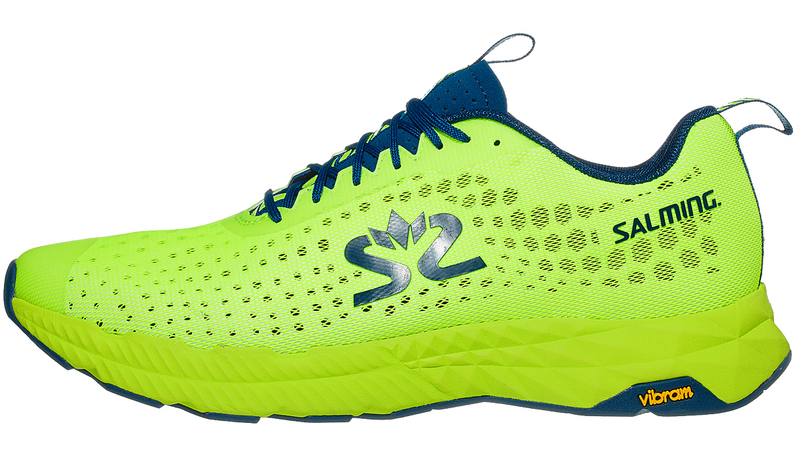 Salming maintains this shoe is crafted for hard-surface running, allowing the runner to “unleash the Greyhound in you!” I was interested to see if my favorite shoe company from Sweden had a hit. West Coast Meghan: I knew absolutely nothing about the Salming brand before receiving the Greyhound, so my opinions below are completely free of any preconceived notions. 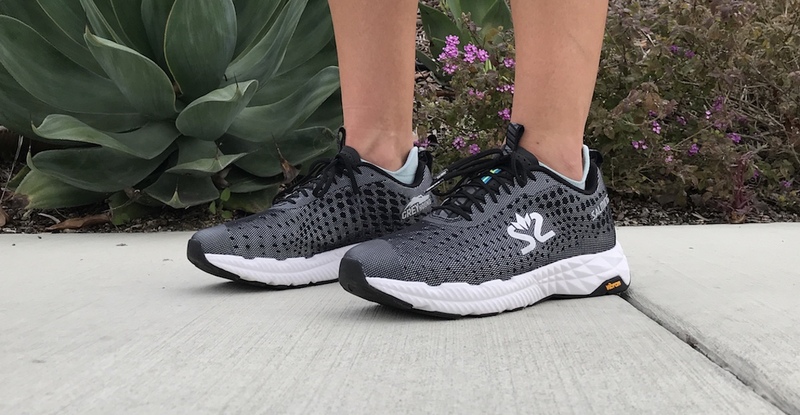 Like Chris, I was excited that the shoe is touted as “tailored for hard-surface running and the impact forces that come with it.” With the majority of my miles spent on the pavement, it sounded like the perfect shoe for me. Chris: Coming in at 9.8 oz, this size 9.5 shoe felt a bit heavy compared to the Salming Distance 5 (8 oz), but it wasn’t really supposed to be the same type of shoe. The foam is more responsive and there is just more shoe to fill. I would compare it to something like the Adidas Ultraboost, which was quite shocking to me to even think out loud, but in a good way. Salming has stepped up their game; their Recoil midsole is comparable to the energy return of an Adidas or even a Nike shoe. I didn’t know what to think when I first took them out of the box. There aren’t a lot of color options, so I choose the fluorescent yellow because I’m an obnoxious runner and I run around at night and would rather be seen. The upper is made from a lightweight one-piece three-layer construction that allows for tremendous support and a snug fit. Underneath the outermost mesh web of the upper lies a layer of perforated foam that allows for breathability. The innermost layer is a snug bootie. The shoe also features a gusseted tongue. I took these on short intervals as well as longer paced runs and they perform admirably, both on hills and paved trails. They absorb the impact of the road and allow me to excel through each step, unlike other shoes I’ve run in without the Recoil technology. I’m used to running with a much longer stride as I transition towards race pace, but what I noticed is that, much like a greyhound, as you shorten your stride, you can allow the shoe to propel you forward almost effortlessly. Perhaps their marketing team has it right. One thing I do want to touch on is the shoes ability to absorb impact. While I wouldn’t condone running while very injured, if you’re having knee or joint paint, these shoes do take a lot of the beating for you. 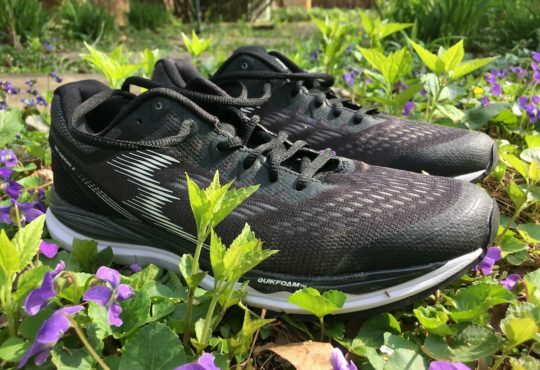 If you’re worried about slogging out a hilly route with transitions between pavement and sidewalk, these shoes are a great asset to your collection. West Coast Meghan: Out of the box, the Greyhound midsole felt like a dream. Walking around the house, I was surprised by the instant comfort, the mold-to-your-feet feel of the cushioning, and the slight springiness. They didn’t squish and flatten out and I was hopeful this feeling would maintain while running. On the roads, I was even more impressed with the responsiveness. The cushioning was fantastic! Each step felt properly supported and springy, propelling me into the next step. With the grippy Vibram outsole, this is a great alternative to hitting the trails for recovery runs. Honestly, these are the first ‘cushioned’ shoes that don’t feel like pillows, where the energy of each step dies upon contact. Win! In general, the look of the women’s Greyhound (and men’s- they’re both the same colors) is right up my alley. Monochromatic all-black mesh with grey reflective logos? Yes, please! Not to mention the simplistic dotted pattern to give the shoe a little texture, the thin laces, and the unobtrusive tongue. All things that appeal to me, personally. 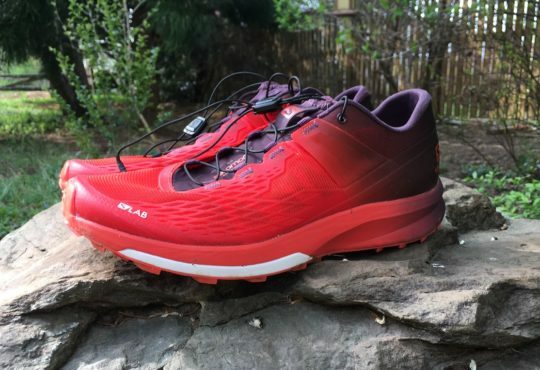 Robbe: My previous experience with Salming was with their OT Comp, which isn’t a comparative shoe (but one that I loved), so this was a new experience for me as well. My positives are in line with both Chris and Meghan. This is honestly one of the best feeling midsoles I’ve had the pleasure to run in. My best comparison is the energy return of Nike’s React technology, with the cushion of a Hoka, but better. It perfectly straddles the line between soft and firm. I really, really want to experience this again. I also loved the grip of the Vibram outsole. It adds to the weight, but it performed flawlessly when taking wet sidewalk corners in the city. Thomas: This shoe wowed me with the midsole. The Recoil foam is soft but with but has bounce. The energy return is impressive. The Vibram outsole delivers traction out the yin yang. The kind of traction that makes you feel confident on the unpredictable surfaces in late Winter/early Spring. The tongue and lacing were nice improvements over previous Salming models. Chris: Compared to other Salming shoes or ones that are meant to target a racing-audience, the shoe feels a bit clunky. It doesn’t necessarily feel heavy in any way, just feels like it has a bit too much foam. The shoelaces, while thinner, tend to tighten a little too much around the tongue, which means you start to feel it as your run wears on. I find myself leaning a little too far forward while running with the 6mm drop, so running down hills can be quite tricky without feeling like I’m in a bounce-castle. That’s probably more to do with my running style than the shoes themselves though. West Coast(WC) Meghan: For me, with the cushion setting my world on fire, I really wanted to love these shoes and keep them on permanent rotation. Sadly, that won’t be the case. The toe box of the Greyhound is far too small, even with my narrow feet. Additionally, the material of the upper is surprisingly stiff. It might loosen over time, but for the runs, I went on, I came back with tender toes and the beginnings of blisters. In addition, the combination of the harder plastic that covers the toe cap, and what feels like a double layer of fabric inside the toe area, adds even more pressure. The size of the shoe was appropriate, but my toes felt banged up after every run. The upper is advertised as “a lightweight one piece 3 layer construction that holds the foot in place, provides great breathability and a snug fit.” Holds the foot in place, check. Snug fit, maybe too much but, check. Great breathability, um… I feel like my feet suffocated a bit. With the stiffer material and the lining, the shoe was really hot. Lastly, the lining of the shoe bled into my socks the more I sweated. After every run, I walked away with stained socks. As a self-proclaimed sock connoisseur, I’m glad I never wore my favorite socks while running in these shoes! Robbe: My negatives are mostly the same as Meghan’s. I have no doubt that these are durable shoes and will last well over 400 miles; however, it comes at a cost. They’re a tad on the heavy side, and the upper is just too stiff. At times I felt the collar digging into my ankle area. I’m not so sure these are made or break for me, but I’d like to see something a little more breathable but with the same amazing midsole. Thomas: The last few Salming trainers have been too long so I went down a half size. Lengthwise the half size down was a good call, but the toe gets very shallow in the Greyhound. the toe cap made the already inflexible upper even stiffer causing a small amount of discomfort. Chris: The minute I took the shoes out of the box, I knew I’d be running in these for a long time. They’re perfect for long tempo runs and take a lot of the beating my knees and joints would be taking as I step up the miles. 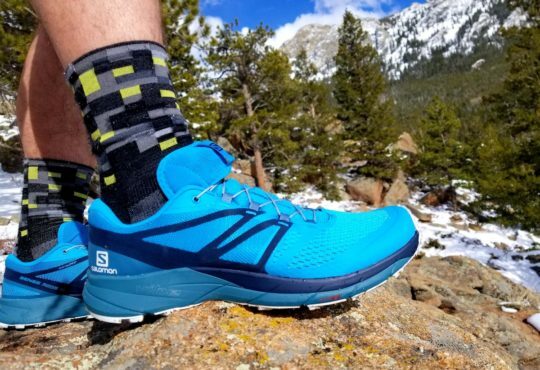 While the $155 price tag is a bit high for Salming footwear, the technology that they’ve developed and put into the shoe merits the increase. I’ll watch this brand as they continue to make strides in the right direction with their new footwear releases. WC Meghan: I’m disappointed these shoes don’t make the final cut. The cushion had me questioning if I could ‘deal with’ the tight toe box but, after several runs, that was a hard no. Here’s hoping that future iterations of the Greyhound widen the forefoot. I think then it would be a slam dunk. Robbe: I always forget this with Salming shoes, but if you’re on a line of some sort for sizing, definitely go down. I wish I had gotten a half size smaller. I could still run in them with a heel-lock lacing, but it would’ve been more snug and altogether better if I had gone a half-size down. That said- don’t sleep on Salming. This midsole is incredible, they definitely focus on durability and quality, and with a couple of tweaks, I can see them providing a formidable product at a competitive price well into the future. Thomas: The Greyhound is a large leap forward for Salming. 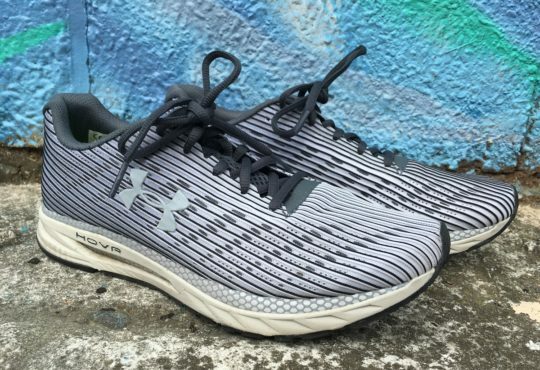 This is the most cushioned shoe I have run in from the Swedish brand, and it is headed in the direction of being a top-notch trainer. The Greyhound just needs some tweaks to get it there. Here would be the items I would address to make this a stellar shoe for my tastes. First, soften up the upper with an engineered mesh. Second, keep the Vibram, but use less of it in both thickness and coverage. Finally, I have to get the fit right for Salming, my 10.5 is too long and the 10 fits but the toe box toebox gets to shallow. A stretchier fabric for the upper may take care of the toe issue. 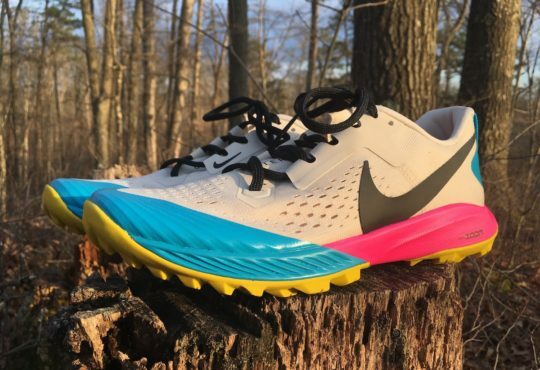 This shoe is so close to what I want out of an easy daily running shoe. I did some shorter runs in the Greyhound, my longest single run in them was 18-miles. Even with my wish list of improvements the shoes still performed well for me and my legs did not feel beat up after the 18-mile run. Robbe is the Digital Marketing Manager for Big Run Media/BITR. He lives in Baltimore with his wife and two sons and runs with the Faster Bastards. 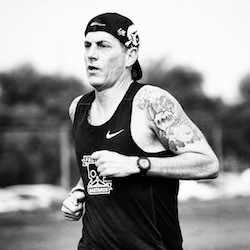 His favorite race distance is the marathon and his favorite beer is anything but Blue Moon. Meghan has been an avid runner since the age of 4. She loathes the easy aerobic run and would rather destroy her lungs (and legs) by running fast in circles. Alas, not every day can be a speed day for an endurance athlete.